Our Garston Tae Kwon Do and Krav Maga students took part in a Krav Maga grading on Sunday 29th January 2017. This was with the aim of achieving their 2nd level grading. 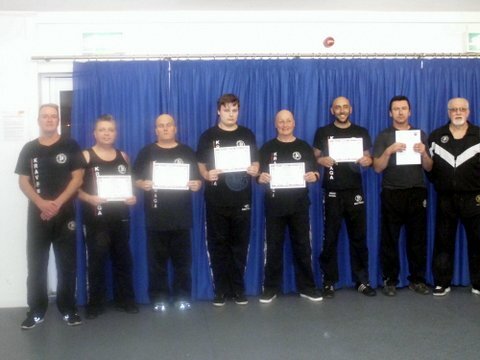 All students were required to perform a number of defensive and attacking moves to demonstrate to the instructors that they were worthy of the grading. There were 5 instructors at the Hemel Hempstead training hall, including top instructor Alex Paris, so the students had their work cut out to impress. The grading syllabus consisted of defensive techniques to combat open hand, knife and gun attacks, as well as disarming the attacker. They were also required to demonstrate their knowledge of the various arm locks and take downs (the art of putting your attacker on the ground). We are pleased to announce that all of the following students passed: Darren Norris, Nik Kershaw, Shane Fraser, Adrian Kitachi, Tim Barlow, John Nicholls, Jack Nicholls, Aiyaz Ahmed and Abhimanyu Dasa. If you are interested in finding out more about Krav Maga, you can join us on a Monday evening 7.30 in Garston, Watford (first lesson is free) or call Master Dave Sealey 01923 679904 to ask any questions.